There are very few places whose names are embedded in history for displays of extraordinary valour and courage. Once the capital city of the Mewar dynasty under the Rajputs, Chittorgarh tells the heroic tale of utmost bravery by its kings to defend the land from external invasion. Chittorgarh has witnessed series of both war and triumph and it's the spirit that is well-preserved in its architectural marvels that stand strong till date. Chittorgarh is also the place of the historical battle between Rana Kumbha and Alauddin Khilji that marked a turning point in history. The fiery spirit of the Rajputs is reflected in the walls of the palace, where, legend has it, the supreme sacrifice, Jauhar, was performed by Rani Padmini. The city stands telling the tales of blood and gore through the forts and palaces which are still well-preserved. Summers in Rajasthan are scorching hot and dry and the temperature can reach 45 degree Celsius. Monsoons bring unexpected rains at Chittorgarh and is a good time to visit. Winter is pleasant; however, the nights get cold. October to March is considered as the best season to make a visit. Ahmedabad to Chittorgarh is roughly 400 km depending in the route taken. There are three primary routes along the national highway to reach Chittorgarh. Route 1 is the shortest route and the roads along the NH 48 are well-maintained. The route even offers great sights along the journey. Fuel for vehicles and local eateries are also readily available while travelling through route 1. Located at a distance of 85 km from Ahmedabad, Himmatnagar is a major tourist spot. The Tirupati Rushivan is located near the highway and is a great amusement park. Enclosed by the Sabarmati river on one side, Tirupati Rushivan has a beautiful landscape garden perfect for a family outing. There are lots of rides for kids while for adults the adventurous ATV ride is available here. Food is, however, not available except for few ice cream parlours. Further ahead lies the Roda Temple, which is a group of 6 temples along with a rectangular water structure dating back to the 8th century. These temples stand as one of the oldest structures of Gujarat. 115 km from Himmatnagar lies the small town of Rishabhdev. It is a well-known pilgrimage centre for the Jain community. The site is flocked by devotees round the year. The temple is dedicated to Lord Rishabh Deva who was the first Jain tirthankara. The sanctum sanctorum hosts the main deity carved on a single rock of black stone in the Padmasana posture and is about 3.5 feet tall. The ambience of the place is quite calm and is perfect to rest for a few moments, soaking the divine spiritual essence emboldened in silence. One of the most popular tourist destinations of India, Udaipur lies 68 km ahead of Rishabhdev. Udaipur is called the City of Lakes. Pristine aquatic environments flock the entire city like the Fateh Sagar, Pichola and the Udai Sagar Lake. There are numerous tourist destinations to be visited but if there is a crunch of time, make sure to visit the City Palace and the Lake Palace. Udaipur is also a proper shopping destination for ethnic garments and handicrafts readily available on the streets. 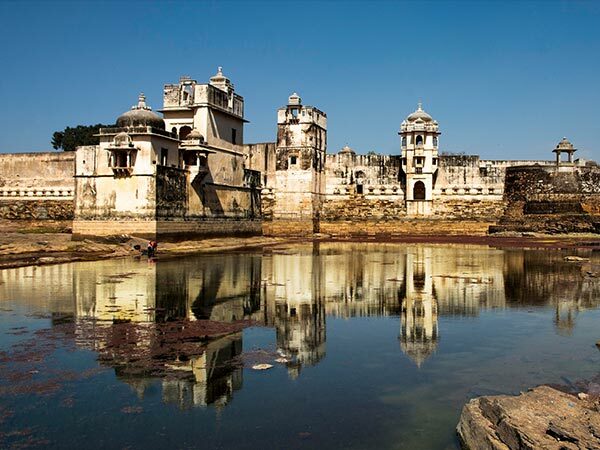 Chittorgarh (Chittaurgarh) is the epitome of Rajput pride, spirit and romance. It reverberates with history of heroism and valour that is attested through the tales sung by the bards of Rajasthan. One evident reason for visiting Chittorgarh is its massive hilltop fort, which depicts Rajput culture and values. The fort of Chittor is regarded as one of the most outstanding forts of the country and is called the pride of Rajasthan. The formidable fort is perched atop a 180-metre-high hillock covering an area of 700 acres and is a standing sentinel attesting the courage and valour of Chittorgarh. The history can be traced back to the Mahabharata. It is said that the fort was built by the Mauryans and further structures were added by the successive Mewar rulers. The mile-long road to the fort is quite steep and exhaustive. The entrance is approached through seven huge gateways or pols, guarded by a watchtower and massive iron-spiked doors. Chittorgarh Fort is also called Water Fort. The fort had 22 waterbodies including talabs, baolis and kunds. The waterbodies have a natural catchment area and the design is seepage proof. The fort spreads over 700 hectares, out of which 40 per cent are given over to waterbodies. In a year witnessing more than normal rainfall, enough water would be stored to last the next 12 months and can sustain an army of 50,000 for four years! The tower was built to commemorate the victory of Maharana Kumbha over Mohammad Khilji. It is a 9-storey tower adorned by marvellous sculptures of Hindu gods. The top of the watertower provides a majestic view of the whole town and gets illuminated in the evenings, giving it a mesmerising effect. The tower is dedicated to the Adinath Ji and is adorned by the naked figure of the Digambaras. There is a narrow stairway reaching up to the 7th storey. A deep tank filled with water, believed to have come from a cow's mouth, is located at the edge of a cliff. Feeding the fish is considered sacred. The palace is the ruined edifice of great architectural and historical story and is the most massive monument in the Chittorgarh Fort. The palace is said to have underground chambers where Rani Padmini is said to have committed Jauhar, escaping the wrath of Alauddin Khilji. The scene of the palace was once responsible for the fierce battle between Rana Ratan Singh and Alauddin Khilji. There is a pleasant pool to visit nearby. Chittorgarh is known for its devotion to Meera. There is a Vishnu temple built by Maharana Kumbha with beautiful idols, pillars and mandaps. Inside the premises is also located a small temple dedicated to Lord Krishna.